Please Note: I am in the middle of updating this site (as usual it's taking a wee bit longer than one might hope). Links from the LINK bar above or some of the other pages herein may NOT work for the moment. My website for HiEnd audio design. Scientific Instrumentation, Consumer Products & Audio. Hardware, Firmware, FPGA, PCB layout, 3D CAD. Underwater Instrument FlashLamp PSU and Trigger Pack. 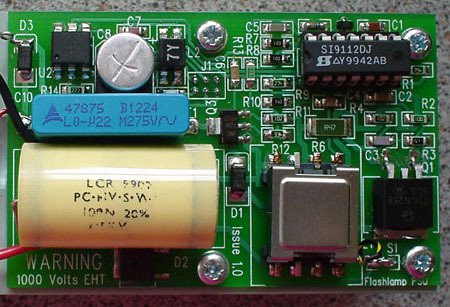 A specially developed low power circuit using a Switched Mode Power Supply for charging a capacitor to 1200 volts. A custom "Trigger Pack" (shown un-potted) reduces the quiescent charged load on the supply by half from that of the Hamamatsu module previously used. The supply has a low standby current and can charge to 1200 volts on demand in under 10 mS giving a top operational rate of 100 flashes per second from a special high quality Xenon short arc flash lamp which is a point light sources providing high luminance and colour temperature. The flash lamp emits a continuous spectrum of light, ranging from ultraviolet through visible to infrared. Filters select the light wavelengths of interest for excitation and a photodiode detector measures the amount of light returned to the instrument. 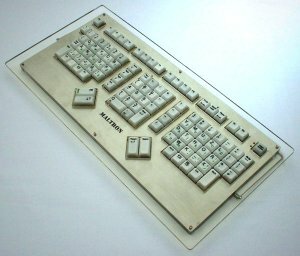 Prototype Design Concept Ergonomic Flat Split-Hand Keyboard. Developed as an alternative to Maltron's full 3D ergonomic keyboards this design is to provide as much relief as possible for people who are suffering from "Work Related Upper Limb Disorders" WURLDS and "Repetitive Strain Injury" RSI problems but who want a more conventional keyboard. Read the British Computer Society Review 2004 article "Let's talk sense about keyboard induced pain" for some background as to why these ergonomic keyboards are so important. I also designed alternative symbols to the Micro$oft Windoze and Menu keys so that one keyboard layout could be used interchangeably for PC, Linux and Mac systems. Audiophonics is my brand name for my audio design work. Originally developed between 1992 and 1996 (Sphere Speakers, Bass Speaker and the Zeus Audio Amplifier) I have continued to work on refinements and improvements. Please see my Audiophonics website for further information. Copyright © 1975-2010 Susan Parker (unless otherwise credited).